Dana's operating philosophy is based on a set of principles that translate globally; examples include continuous improvement, customer satisfaction, innovation and technology, and quality. The sum of these cultural values is one team – “One Dana” – focused on one purpose: creating exceptional value for Dana shareholders by delivering superior products and service to Dana customers. 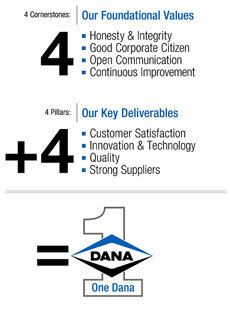 The One Dana philosophy also shapes the Dana Operating System, which provides company operations and employees globally with a standard set of values, processes, tools, and metrics to help achieve ever-higher performance in the areas of safety, quality, efficiency, productivity, costs, and inventory. The company's matrix organizational structure, likewise, is designed to help Dana leaders drive world-class performance across the enterprise and, ultimately, to aid the delivery of exceptional products and services to customers. The matrix helps Dana people strengthen capability within and across three key areas – functional/support groups, product groups, and geographic regions.